‘Compensation’ also known as ‘adaptation’ occurs through-out training for a swimmer’s performance to improve. This is when after a period of intense training fatigue occurs followed by rest & recovery which produces an overall improvement in performance. Effort followed by recovery that results in adaptation occurs daily, even twice daily if an athlete swims/exercises more than once and during the week if there is rest or period out of the water/not exercising (desired or otherwise). Super-compensation is simply a heightened, lengthened or extreme version of other minor or regular periods of compensation. In other words, after many weeks or months of intense training a longer period of rest and recovery occurs that is designed to produce ‘super-compensation,’ or compensation that goes beyond the usual degree of adaptation, so that the resulting performance in an important competition is greatly enhanced. How long should a taper be for a swimmer? The duration and timing of a tape will vary from swimmer to swimmer and depend to some degree on the importance of this event to this swimmer and the team for whom they swim, as well as the event or events or specialisation … as well as their age, levels of fitness and expectations. Age group swimmers need little tapering as they haven’t the muscle bulk that would benefit from the adaptation process of the taper, whereas as Senior swimmers competing in a sprint event may benefit greatly from a longer, deeper period of tapering. 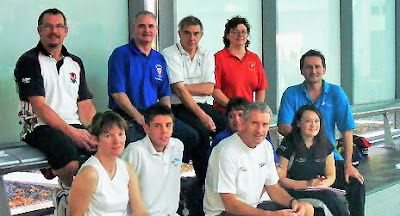 If a swimmer is keeping a logbook and they, perhaps their parent and/or team manager, and especially their coach and/or assistant coach, know and understand this swimmer’s make up, physical & psychological, as well as other factors that may impact on their training and the nature and need of a taper such as school trips &/or national exams, then between them a taper, that is to a degree bespoke, cane be planned for. Educate athletes to understand why the need to be hydrated during training and at competitions is important. This ‘education’ ought to include a classroom/conference style presentation, with supporting literature and perhaps drink samples provided by a sponsor. As well as publicity for the event going onto the club website, in the club newsletter, on the club notice-boards and in swimmer’s log books, a sheet outlining hydration principles would be used to make the information readily available to swimmers, coaches, parents & team managers. Ensure that swimmers have drinks poolside and that these are suitable to their needs – some energy drinks containing too much glucose for example. Travel distance to the location. Outdoor, v.humid poolside, poor seating, nature of warm-up arrangements – is there a separate pool for warm ups & swim downs? 25m or 50m. Local weather and time zone, time of year (hot, cold, wet, snow etc) Changing rooms/cubicles, team changing, quality and cleanliness of toilets/showers. Access to appropriate food & drinks. Lighting, distance from changing rooms to pool. Temperature away from the pool. Crowding. Bins. Ease of reading electronic boards. Ease of greeting parents/friends. Sound. Over a day or days, how long during the day between warm up and heats and events. Heat declared winners or finals. Award ceremonies during or after events. Electronic timing or officials … or both. Just as swimmers competing in events where they could appear to do so badly they are humiliated so swimmers that run away with the events won’t gain anything if they are just swimming against the clock and if they mock the event by swimming slowly it does them and the club harm.